Yantra Yoga or the Yoga of Movement, is one of the oldest recorded systems of Yoga that exists in the world. It is a system of Yoga that has come to us through Tibet, a land full of a vast and rich traditional Buddhist knowledge and wisdom. The uninterrupted tibetan lineage of Yantra Yoga is a fundamental method to integrate the profound essence of the Dzogchen Teaching in the three doors (body, voice and mind) of the practitioner. Through positions and movements combined with breathing, one's energy is coordinated and harmonized so as to let the mind relax and find its authentic balance, which is the basis for contemplation. In Yantra Yoga there are many positions similar to Hatha Yoga, but the way to assume them differs. In Yantra Yoga a sequence of seven phases of movements connected to seven breathings is used. In particular, in the central phase of the movement the position helps create specific retentions of the breath that work at a subtler and deeper level. For this reason it is not only the main position but the entire movement that is important. 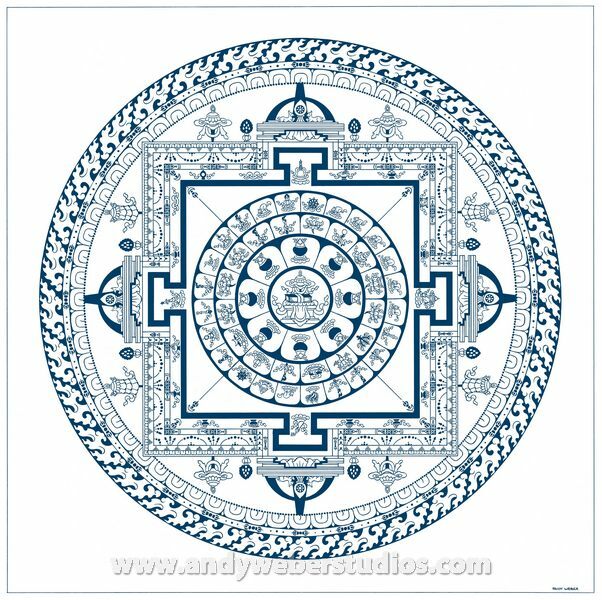 The word Yantra is a Sanskrit word, but in Tibetan has different meanings. Yantra can mean geometrical form, like a mandala, or it can mean movement of the body. In Tibetan we say trulkhor, which means movement. We use movement to coordinate or guide our prana, or vital energy. The Yantra Yoga that I teach is called Nyida Khajor. In Tibetan nyida means sun and moon and khajor means union. That is the title of the original teaching taught by Vairocana, who was one of the most important students of Guru Padmasambhava and a great translator. 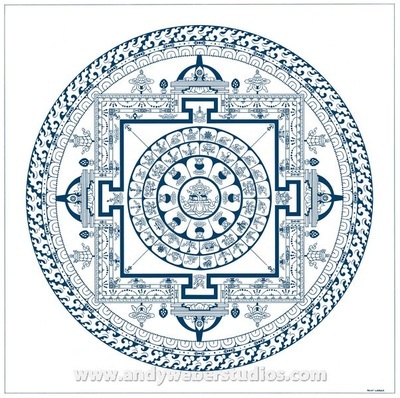 Vairocana received the transmission of this Yantra Yoga teaching from Guru Padmasambhava, who received it from a great Mahasiddha called Humkara. This is the lineage of this teaching and then it was transmitted from Vairocana to Yudra Nyingpo and various other masters. Besides this text there is an oral transmission of Yantra Yoga. It is very difficult to understand Yantra Yoga only by reading the original text and not having a teacher. Practitioners of Dzogchen have applied these methods for centuries. I learned them principally from one of my Japanese buddhist teachers who was an excellent practitioner of Yantra, as well as of the 6 Yogas of Naropa. In the practice of Yantra Yoga we use our body, voice and mind. With the body we do positions and movements, with the voice there are many techniques of pranayamas or breathing practices and with the mind there are many ways to concentrate and visualize. The aim is to go beyond judging and thinking with our mind and we call this contemplation. When we apply all these three aspects together, we have the possibility to arrive at our real knowledge or the understanding of our primordial state, our original condition. That is the real meaning of 'yoga' in Yantra Yoga. During a period of 3 months, we will cover 2 groups of preliminary practices. 1 group consists of 5 exercises that prepares, opens and mobilize the joints. The other 8 exercises is for introducing the different components for correct and developed breathing. Then we will practice some of the yantras from the first and second group of 5 yantras that develop and deepen the different types of breathing and holds. Each yantra consists of 7 movements; during the main part the position has a characteristic type of breath or hold. Finally one tries to apply all the breathing and holds in 2 types of pranayama the basis for Kumbacker. Yantra Yoga will help you coordinate your energy and improve your health. Discover deep relaxation of body voice (energy) and mind. Improve in your meditation, experience boundless energy. Our address; 113 Circle Road, Tableview, Cape Town, at Samurai Studio. If you want to enrol in 3-6 period of intense yoga training, go to contact us page, send us a message, we'll be back to you with all the details you need. NOTES ON - TIBETAN BUDDHISM TRADITION. LINEAGE OF MASTERS. FORMS OF YOGA. Tibetan Buddhism. Yoga is central to Tibetan Buddhism. In the Nyingma tradition, the path of meditation practice is divided into nine yanas, or vehicles, which are said to be increasingly profound.] The last six are described as "yoga yanas": Kriya yoga, Upa yoga, Yoga yana, Mahā yoga, Anu yoga and the ultimate practice, Ati yoga.The Sarma traditions also include Kriya, Upa (called Charya), and Yoga, with the Anuttara yoga class substituting for Mahayoga and Atiyoga. Other tantra yoga practices include a system of 108 bodily postures practiced with breath and heart rhythm. The Nyingma tradition also practices Yantra yoga (Tib. Trul khor), a discipline that includes breath work (or pranayama), meditative contemplation and precise dynamic movements to centre the practitioner. The body postures of Tibetan ancient yogis are depicted on the walls of the Dalai Lama's summer temple of Lukhang. A semi-popular account of Tibetan Yoga by Chang (1993) refers to caṇḍalī (Tib. tummo), the generation of heat in one's own body, as being "the very foundation of the whole of Tibetan Yoga". Chang also claims that Tibetan Yoga involves reconciliation of apparent polarities, such as prana and mind, relating this to theoretical implications of tantrism. The Six Yogas of Nāropa (Tib. Narö chö druk, na-ro'i-chos-drug), also called the six dharmas of Naropa and Naro's six doctrines, rendered in English as: Wisdom Activities Path Six Methods of Accomplishment) are a set of advanced Indo-Tibetan Buddhist tantric practices and a meditation sādhana compiled in and around the time of the Indian monk and mystic Nāropa (1016-1100 CE) and conveyed to his student Marpa the translator. The six yogas were intended in part to help in the attainment of siddhi and enlightenment in an accelerated manner. The six yogas are a synthesis or collection of the completion stage practices of several tantras. In the Kagyu traditions by which the six yogas were first brought to Tibet, abhiṣeka into at least one anuttarayoga tantra system (generally Cakrasamvara and/or Vajrayogini/Vajravarāhi) and practice of its utpatti-krama are the bases for practice of the six yogas; there is no particular empowerment for the six yogas themselves. tummo (T: gtum-mo, S: caṇḍālī) — the yoga of inner heat (or mystic heat). gyulü (T: sgyu-lus, S: māyākāyā) — the yoga of the illusory body. ösel (T: hod-gsal, S: prabhāsvara) — the yoga of the clear light or radiant light. milam (T: rmi-lam, S: svapnadarśana) — the yoga of the dream state. bardo (T: bar-do, S: antarābhava) — the yoga of the intermediate state. This is well-known through the Bardo Thödöl. Bardo yoga as the yoga of liminality may include aspects of gyulu and milam and is therefore to be engaged as an extension of these disciplines. 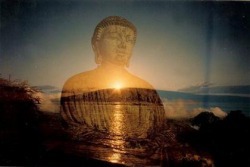 Phowa (T: hpho-ba, S: saṃkrānti) — the yoga of the transference of consciousness to a pure Buddhafield. forceful projection, into another body. This technique may no longer be extant, or is kept secret. The forceful projection of the mindstream into the bodymind of another is a variation that consists of elements of phowa, ösel and gyulu. Keown, et al. (2003) list a "seventh yoga" that is a variation of phowa, in which the sādhaka by transference (grong-'jug), may transfer their mindstream into a recently deceased body. 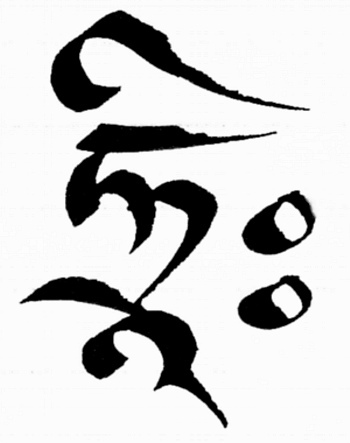 kāmamudrā or "loveseal" (sometimes karmamudrā or "actionseal") (T: las-kyi phyag-rgya). This is the tantric yoga involving a physical partner. Like all other yogas, it cannot be practiced without the basis of the inner heat yoga, of which kāmamudrā is an extension. There are many practices and physical exercises called yantras, preliminary to the inner heat yoga. A good example of this is the visualization on the body as being hollow: "here the body and the energy channels (nadis) are to be seen as completely transparent and radiant". This essential technique releases tensions and gives suppleness to the prāna channels. 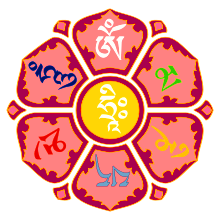 As Nāropa is regarded as a Kagyu lineage holder, the six meditative practices are strongly associated with the Kagyu lineage of Tibetan Buddhism. The teachings of Tilopa (988-1069 CE) are the earliest known work on the six yogas. 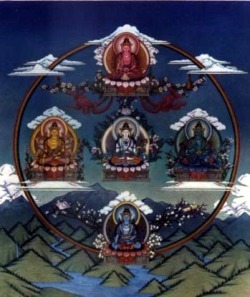 Tilopa is said to have received the teachings directly from Cakrasaṃvara. Nāropa learned the techniques from Tilopa. Nāropa's student Marpa taught the Tibetan Milarepa, renowned for his yogic skills. Milarepa in turn taught Gampopa. Gampopa's student, the future first Karmapa, Düsum Khyenpa, attained enlightenment while practicing the six yogas. The Karmapa, the first figure in Tibetan Buddhism whose reincarnation was officially recognized, has been strongly associated in certain reincarnations with particular yogic attributes. Many Gelugpa practitioners including Dalai Lamas are expert in the six yogas of Nāropa. The six yogas of Naropa are ordered and progressive. Meditation on the Body as an Empty Shell Here the body is envisioned as being entirely without substance, appearing in the mind like a rainbow in the sky. This meditation and the physical exercises should be practiced in conjunction with one another. Stages of Meditating upon the Actual Path Inner Heat (Tib. gtum-mo) Visualizing the channels, Visualizing the mantric syllables and engaging in the vase breathing technique. This gives rise to five signs: like a mirage, like a whisp of smoke, like the flickering of fireflies, like a glowing butter lamp, and like a sky free of clouds. Four Blisses (Tib. dga'-ba bzhi) Bliss at the throat chakra, supreme bliss at the heart chakra, inexpressible bliss or special bliss at the navel chakra, and innate bliss at the secret place, tip of the jewel. This is accomplished by relying on two conditions; the internal condition of meditating on inner heat yoga and the external condition of relying upon a karmamudrā. Karma Mudrā A maiden possessing the physical attributes of a woman, for dull yogis. Jñāna Mudrā A maiden created through the power of one's visualization, for middling yogis. Mahā Mudrā The images within one's own mind spontaneously arise as various consorts, for sharp yogis. Samaya Mudrā The mudra experienced as a result of accomplishing the former three. Pure Illusory Body (Tib. dag-pa’i sgyu-lus) Meditations on all appearances as illusory, dream illusions, and bardo experience. Actual Clear Light (Tib. don-gyi ‘od-gsal) The four emptinesses lead to the experience of clear light during the waking period and sleep.. These last four yogas are extremely complex and require many years of training under a accomplished teacher.